Pocklington Canal Amenity Society: Easter trail and canal exhibition at Melbourne Arm (as well as usual boat trips). Noon to 4.15pm. IWA Towpath Walks Society, London: Regent’s Canal: King’s Cross – Hitchcock’s Hackney. Starts 2.30pm from King’s Cross taxi rank. Costs £10, £8 student/concs. Contact Roger Wilkinson 0203 612 9624. Standedge Tunnel & Visitor Centre: Easter fair and tunnel trips including wide range of food and craft stalls as well as a barbecue, wood-fired pizza oven, gin bar and live music. For children there will be face painting and an Easter egg hunt. Derby & Sandiacre Canal Society: NOTE NEW VENUE Jeanne and Derek Smith present Cruising on Remote Waterways. The Coach and Horses, Victoria Road, Dracott, Derby DE72 3PS, 7.30pm. Members £2, non-members £3. Pocklington Canal Amenity Society: AGM and history talk about the Pocklington Canal. Melbourne Village Hall, 7pm. IWA Lancashire and Cumbria Branch: Tony Entwistle will be celebrating the 200th anniversary of the opening of the Lancaster Canal and giving an update on what is happening with the CRT. St Chad’s Parish Centre, 235 Town Lane, Whittle-le-Woods, Chorley, PR6 8AJ. Venue open 7pm (bar available), meeting 7.30pm. IWA East Yorkshire Branch: Social meeting, The Yorkshire Air Museum: A national Treasure, presented by Ian Richardson. Methodist Church Hall, Cottingham HU16 4BD, 8pm. Coal & Canals: Multi-media show telling the histories of coal and canals. From the five-piece Zouch Band, 14 great songs telling the stories of these industries alongside film and narration. Written and produced by Brian Langtry. Armitage Village Hall, 7.30pm. Entry £10. More details from Brian on 01530 416251. River Canal Rescue boat and engine maintenance course: RCR Baswich head office (by bridge 101 on the Staffordshire & Worcester Canal). £120 (two days). Enquiries to enquiries@rivercanalrescue.co.uk or call 01785 785680. Coal & Canals: History, heritage, film, song and narration with the five-piece Zouch Band. Willington Village Hall, 7.30pm, £10. Pay on the door. Phone 01530 416251 for details. Canalway Cavalcade: London’s biggest waterways festival. Little Venice. Norbury Canal Festival: All the traditional attractions, plus live bands. Traditional Sunday canalside church service 3pm. Norbury Junction, Staffordshire, ST20 0PN. IWA Towpath Walks Society, London: Regent’s Canal: R. Tyburn – Little Venice. Starts 2.30pm from Baker St tube station (Baker St north/Lords exit). Costs £10, £8 student/concs. Contact Roger Wilkinson 0203 612 9624. Sandiacre Lock Cottages: Visit these historic 1779 cottages, 11am to 3pm. Erewash Canal, Lock Lane, Sandiacre NG10 5LA. Admission free. For details contact Glyn Stenson 0780 925 1441 or glynstenson@hotmail.com (also May 19, 1.30pm to 4.30pm and May 27, 11am to 3pm). IWA Lichfield: Penkridge and Rodbaston College Walk. An easy 5½ mile walk with five stiles on quiet lanes. Meet at 10.15am for a 10.30am start in the car park of The Cross Keys, Filance Lane, Penkridge ST19 5HJ. Coal & Canals: History, heritage, film, song and narration with the five-piece Zouch Band. Century Theatre Coalville, 7.30pm, £10. Pay on the door. Phone 01530 416251 for details. Montgomery Canal Triathlon: Organised by the Friends of the Montgomery Canal. 35 miles by bike, foot and canoe. See www.montgomerycanal.me.uk for more details. Pocklington Canal Amenity Society: 50th anniversary dinner. The Oaks, Aughton. Contact 07761963565 or email dejaysmith@btinternet.com for more information. 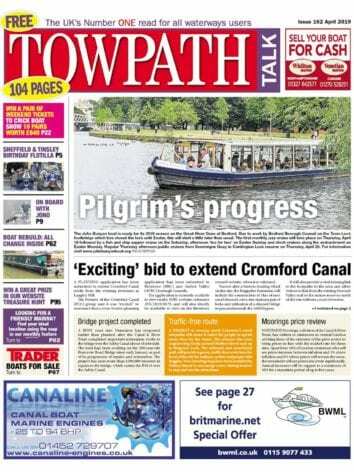 Brownhills Canal Festival: Trade boats, stalls, historic boats, trips, entertainment. Canalside, Silver Street, Brownhills, WS8 6DZ. 10am to 5pm. Pocklington Canal Amenity Society: Pond Life at Melbourne Arm. Drop in and have a go at pond dipping with an ecologist, noon to 4pm. Boat trips running as normal. Contact 07761963565 or email dejaysmith@btinternet.com for more information. IWA Towpath Walks Society, London: Regent’s Canal: King’s Cross – Granary Square – Camden. Starts 2.30pm from King’s Cross (taxi rank). Costs £10, £8 student/concs. Contact Roger Wilkinson 0203 612 9624. Montgomery Canal Forum: Organised by Montgomery Waterway Restoration Trust, 2.30pm, Memorial Hall, Smithfield Street, Oswestry SY11 2EG. Annual event reviewing the progress of restoration and plans for the future. Coal & Canals: History, heritage, film, song and narration with the five-piece Zouch Band. Crick Village Hall, 7.30pm, £10. Pay on the door. Phone 01530 416251 for details. Crick Boat Show: Britain’s biggest inland waterways festival. Crick Marina, Northamptonshire NN6 7SQ. Gloucester Tall Ships: A great spectacle of tall ships, plus adventure and fun activities for all the family. At Gloucester Docks, 10am to 5pm each day. Pocklington Canal Amenity Society: Canal open day at Melbourne Arm, 11am to 4pm. Pond dipping, boat trips and theatrical time travel family walks. Contact 07761963565 or email dejaysmith@btinternet.com for more information. IWA Towpath Walks Society, London: Regent’s Canal: Little Venice – Camden. Starts 2.30pm from Warwick Avenue tube station. Costs £10, £8 student/concs. Contact Roger Wilkinson 0203 612 9624. Derby & Sandiacre Canal Society: Norman Stainthorpe presents Ellesmere Port, 1974-1996, a personal history. The Wilmot Arms, 49 Derby Road, Borrowash, Derby DE7 2HA, 7.30pm. Members £2, non-members £3. This will help you attract many more visitors by placing the event in the newspaper and online. What’s on at the event? Privacy: Your email address will remain private. We will only use it to contact you about your listing.